As evidenced by the lack of big-wordy posts since the weekend before last, not much has been going on lately. Final arrangements for Alaska, putting things in order at work, and resting have been the order of the day. I’ve been really hungry all week, and assuming that it’s not all due to nerves, and that my body knows itself, I’ve been largely indulging in that. Tapering for something like the classic isn’t something I’ve done before, and acting on the assumption that a big part of training has been building up connective tissue, I’ve laid off the big hikes for the last 10 days. Recovery should take longer to peak, so best to do short intense hikes and other things (ski, bike) instead. The numbers on the last few hikes have been encouraging, as was my pace riding Going-to-the-Sun road this morning, so hopefully things are falling into place. As part of a peaking interest in cycling, I’ve been going through yet another should-I-sell-the-Lenz? phase. I might be serious this time. Almost everytime I’ve gone riding this year, I’ve taken the Karate Monkey. When I haven’t, it’s because I wanted gears. So as a trial, I stripped parts off the Lenz and arranged the Monkey exactly as I’d like it to be. It’s a good bike. Gearing is 32 by 11,14,17,21,26. The 26 is the lowest that still works for SS-style climbing, and the 11 is nice for chasing cars downhill (construction on GTTSR had us stopped below the tunnel for 15 minutes, and I was able to keep up with the shuttles and pilot truck all the way down) and sprinting through traffic to and from work. I’ve resolved to keep it this way into August before I do anything. Of course, what I really want as a second bike is a fat bike. Either a pug, or the soon to be released Surly Moonlander with 4.5″ Big Fat Larrys. If I sold the Lenz frame, I’d have all the parts save wheels, BB, and one brake. So if you know anyone that might want to buy a cheap frame, keep me in mind. I leave for Ak early on Tuesday! Tacking on a pic of the Lenz might pique a bit more interest. Loyal follower/lurker here, I appreciate the diversity and sincerity of your posts. It is very well used now, though functionally just dandy, with a 2 year old shock that has minimal miles. 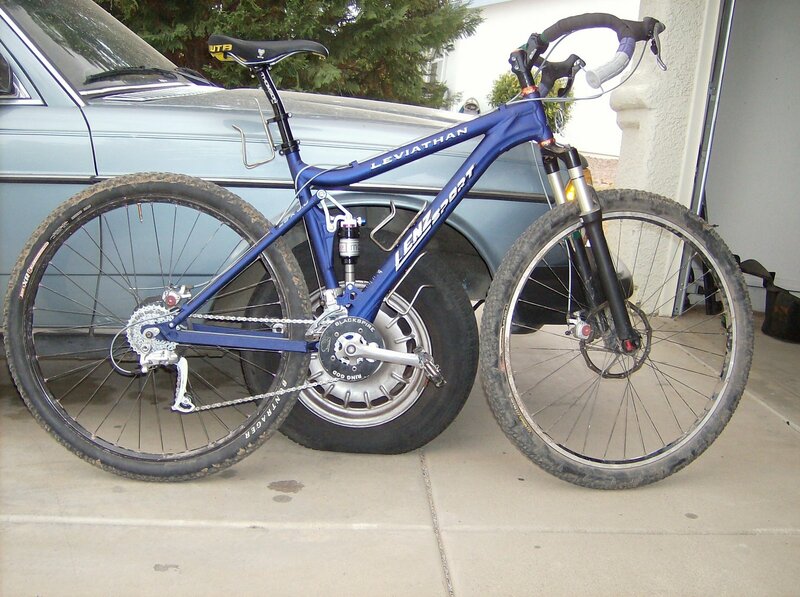 The influx of full suspension 29ers have made it a bit dated in technology and price, but I’d be hoping to sell it cheap to someone looking for a good endurance bike at a good price. If I decide to sell it!